In stock -This product will ship today if ordered within the next 5 hours and 6 minutes. Camu Camu contains the highest amount of vitamin C in any fruit on earth, helping support your immune system. 100% pure Camu Camu is a full spectrum vitamin C which contains hundreds of plant nutrients. Camu Camu is a small tree that can be found in the Amazon. It contains the highest amount of natural vitamin C of any fruit known on earth and has hundreds of extra plant nutrients such as bioflavonoids, vitamins, enzymes, minerals and amino acids. 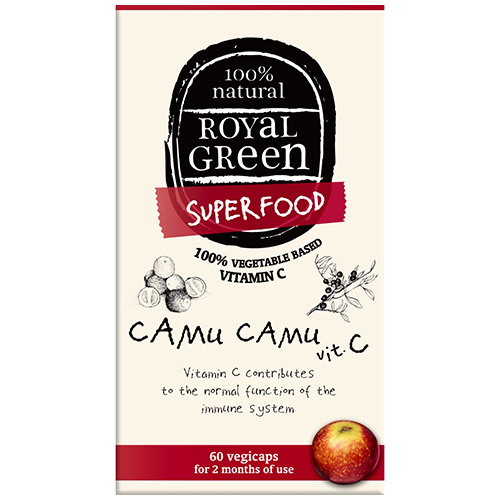 Camu Camu offers about 30 times more vitamin C than an orange and the `full spectrum` 100% whole food form ensures optimum absorption and effect. Camu Camu / fruit from Peru (Myrciaria dubia) 500 mg & vegetable cellulose (vegicap). 1 vegicap per day, preferably with a meal. Below are reviews of Royal Green Camu Camu Vitamin C - 60 Vegicaps by bodykind customers. If you have tried this product we'd love to hear what you think so please leave a review.